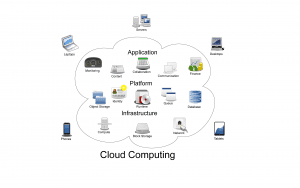 What is Cloud Computing in general? Cloud computing is an [informal] expression used to describe a variety of different types of computing concepts that involve a large number of computers (actual or virtual) that are connected through a real-time communication network (typically the Internet). Cloud computing is a jargon term without a commonly accepted non-ambiguous scientific or technical definition… The popularity of the term can be attributed to its use in marketing to sell hosted services…. OK, so what is “PYMcloud” as a concept? We envision creating various web services to fully support the organizational function of Worship Groups, Monthly Meetings, Quarterly Meetings and Pacific Yearly Meeting inclusively. Basic web presence for each entity within PYM, with Meeting location (with maps/directions option), hours of Meeting for Worship, contact information etc. Secured Directory service with granular details of Member/Attender status, Member of/Attending location(s) … MM/Quarterly/Yearly committee work, preferred method of contact etc. Focused communication at all levels using the single-source of real-time Directory data e.g. Presiding Clerk could send communication to all MM Clerks Peace & Social Order Clerk could distribute a Minute from YM to all local MM P&SO clerks; Youth Program Coordinator can locate all meetings with certain age groups to provide local service-work opportunity in a geographically-centered area; Clerks from Finance committees or Treasurers could communicate directly with each other about best auditing practices, etc. Shared Calendar of events for all entities so everyone can see scheduling conflicts before events are planned. Open-Source Library database system that is shared between Monthly Meetings. Searchable Document storage and retrieval system for Minutes (both inward-focused private content and outward-focused public interest), Committee reports, etc. Yearly Meeting Event Registration functions using the same database of individual contacts as is used for the Directory and Communication functions listed above. Who would be responsible for setting up and managing this system? The Electronic Communications Subcommittee of PYM Ministry and Oversight. Who would manage the Directory Content type of data? Once the infrastructure is setup and tested, we envision current Monthly Meeting Database clerks would have direct access to manage their own data via a web interface. We would have secure access controls and full revision tracking so we would know who accessed the database and which data was changed. What are the underling technologies used to build the PYMcloud? This project will consist of a primary hosting provider using Virtual Private Servers (VPS) (possibly physically located outside of the U.S.A.); Drupal, an open source Content Management System (CMS) for web content controls; CiviCRM, an open source CMS for database and event registrations; and other open source modules can be added as options and needs grow, such as the Library system or Document Storage systems. What are the annual budget needs for PYMcloud? We estimate an annual budget of $1500 as a baseline, and this amount is in the current budget proposal coming before you at this Annual Session. This amount can grow in future years as more options and functions are added in. This starting budget amount allows for annual contributions to the open-source community once we have a working system in place, as well as contingency fees should we need to hire outside technical assistance. This support subcommittee was brought into existence 2010 to increase communication from Monthly meetings and all the functions of PYM and back again. 2. We recommend an alternative to the PYM annual session and Rep Com Meetings if meetings can do so. 3. Changes each year in reps, Meetings PLEASE inform Patricia Smith, assistant clerk or Sandy Kewman. 4. Please share with your meetings the proceedings of Rep Com, particular, the whole report from the PYM Youth Coordinator Supervisory Committee (on line at website above). 5. Please familiarize yourself with tuition application so you can advise Friends in your meetings and encourage attendance at Annual Session. 6. Please know the dates of Annual Session July 29 to Aug 3, 2013 at Mt. Madonna in Watsonville.